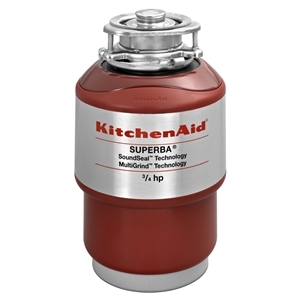 What to Expect from KitchenAid Continuous Feed Garbage Disposal? The old dilemma whether you should compost organic food waste or just throw it away is not an easy one. Not everything can be composted, and food waste waiting for the garbage truck is not as sanitary as we would like it to be. So, the decision to get a garbage disposal unit is a logical one. The technology behind it has progressed to the point that these units are efficient and affordable to everyone nowadays. We took the most popular KitchenAid waste disposal model, and decided to make a thorough analysis of its strong and weak points, pros and cons, and gather all the crucial info. We are going to compile this data into a nice and clean KitchenAid Continuous Feed review. Make sure to go through it in detail, just to make sure that you don`t miss a thing because getting this appliance is a big investment. The initial impression we got after the unpacking is the beautiful red design of the unit. These types of appliances are usually rigidly designed, and this came as a refreshment for us. Though it is a bit heftier, this unit packs a serious punch when it comes to grinding tasks. It is powered by a 3/4 HP induction electric motor, making it a medium-to-heavy-duty machine. At the rotation speed of 1725 RPM, you will be able to get any type of food leftovers processed, besides the bigger bones. As the name reveals, this is a continuous feed model. To find out more about the basic properties and types of disposal units, there is a lot of information readily available. (link the main page here). Additionally, there is a built-in Sound seal module, that helps in keeping the noise to a minimum level. Because it is supposed to work as you work in the kitchen, a low noise level is essential, and we didn`t notice any noise spikes while using it. The unit weighs just under 20 pounds, so it is intuitive and easy to install. Kitchen Aid is in the appliance manufacturing business for over a century now. They have mastered the skill of producing quality and affordable appliances, while constantly upgrading them. The company can be contacted via all communication channels (landline, mobile, website, email and live chat). We were surprised at how well designed their website was and how helpful it proved to be. They even provide good online installation guides. This particular unit is covered by a 5-year limited warranty policy, and the manufacturer guarantees to replace any broken parts and repair any malfunctions, as long as you respect the rules of the warranty agreement. This is one the most powerful units there is, although it is under 1 HP, the 3/4 HP matches the needs of a household with 4 residents with ease. Any type of food you want to get rid of is game, except bigger bones and fibrous plants. We provided a cleaning tutorial in our buying guide, so feel free to check that out also. This continuous feed unit is made to be used every day, just make sure you clean it two times a month, and no problems will occur. We were quite satisfied with the performance of this KitchenAid appliance. It withstood every challenge we threw down the drain, and it did not jam a single time. It is considered a bit pricier when it comes to this type of appliance, but it certainly looks like it is worth the cost. Do not forget, this should be an investment for a longer period of time, so every buck is well-invested. We hope that we have covered all your needs and questions regarding this model in this short KitchenAid Continuous Feed review. If, by any chance, you have some farther concerns or questions, feel free to post them in the comment section below, and we will provide an answer as soon as possible. Do yourself and your kitchen a favor, and get rid of all the nasty odor and dirty food waste with ease.